Airs Wednesday, May 1 at 9/8c on ABC. ABC has issued the press release for the May 2 episode of Modern Family, "Commencement". "Commencement" - Cam is finally getting a chance to shine when he is asked to preside over the high school graduation ceremony at the last minute, while Jay gives the Commencement address. Meanwhile, Claire runs into her former high school rival who brings out the worst in her on "Modern Family," airing WEDNESDAY, MAY 1 (9:00-9:31 p.m. EDT), on The ABC Television Network, streaming and on demand. The tenth season finale will air the following week. Modern Family has already been renewed for an eleventh and final season on ABC. 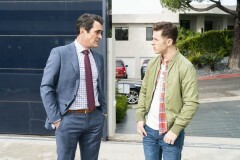 ABC has released the synopsis for the March 20 episode of Modern Family, "Stand By Your Man". Fred Willard returns as Frank Dunphy in the episode. Stand By Your Man - Haley and Dylan's plan to quietly elope before the babies are born doesn't go as smoothly as they had hoped. Meanwhile, Jay continues to try and get his new business off the ground by courting an Instagram celebrity on "Modern Family," WEDNESDAY, MARCH 20 (9:00-9:31 p.m. EDT), on The ABC Television Network, streaming and on demand. ABC has issued the press release for the March 13 episode of Modern Family, "The Wild". “The Wild” – Mitch, Cam and Phil crash Jay’s annual hiking trip to find an elusive bald eagle after Gloria asks them to keep an eye on him. Meanwhile, Gloria, Alex, Claire and Haley get together to plan her baby shower on “Modern Family,” WEDNESDAY, MARCH 13 (9:00-9:31 p.m. EDT), on The ABC Television Network, streaming and on demand. ABC has released the synopsis for the February 27 episode of Modern Family, "Red Alert". Reid Ewing returns as Dylan. Julie Bowen directed this episode. Red Alert – Lily has reached a womanly milestone that Cam and Mitch are not prepared for – at all – so they call in reinforcements on “Modern Family,” WEDNESDAY, FEB. 27 (9:00-9:31 p.m. EST), on The ABC Television Network, streaming and on demand. ABC has issued the press release for the January 23 episode of Modern Family, "What's Next?" Andrew Daly returns as Principal Brown in the episode. “What’s Next?” – While preparing a presentation for his students about their future goals, Cam (Eric Stonestreet) must also contend with a bully at the school and Jay (Ed O’Neil) is having a little technical trouble during his video conference. Meanwhile, the local mall is holding a photo shoot for its new ad campaign and Gloria tricks Phil and Joe into participating, on “Modern Family,” WEDNESDAY, JAN. 23 (9:00-9:31 p.m. EST), on The ABC Television Network, streaming and on demand.